There was little reason to think that the penultimate GP of the season was going to be anything other than another lack-lustre one for Ferrari, and unfortunately so it proved. The picture of qualifying pretty much mirrored the one we have seen over all previous 17 Grands Prix weekends this year, with Mercedes in a class of its own, usually followed by Williams, while a close-knit group of teams battled it out for Rows 3 to 5 on the grid. Fernando Alonso and Kimi Raikkonen started the 71 lap GP from the fourth and fifth rows of the grid, in eighth and tenth places respectively. Like the previous three sessions, this fourth one took place in the dry, as the threat of rain didn’t materialize. Q1 went off smoothly for Kimi and Fernando, who went through to the next stage in seventh and tenth places, although they immediately had to make use of the Soft tyres. The fight was tighter in Q2, with the Scuderia drivers having to use their remaining sets of the softer of the two compounds. This time, they got to Q3, again in seventh and tenth places. In Q3, they were only able to do one run each, with Fernando posting a 1.10.977 and Kimi a 1.11.099. Nico Rosberg took pole for Mercedes with a lap in 1.10.023, just 33 thousandths quicker than team-mate Lewis Hamilton. The second row features the Williams of Felipe Massa and Valtteri Bottas, while row 3 had Jenson Button in the McLaren and Sebastian Vettel in the Red Bull. Alongside Alonso was Kevin Magnussen in the McLaren, while Raikkonen shared row 5 with Daniel Ricciardo in the Red Bull. Rain would certainly have been welcome for the Ferraris, as a wet track reduces the advantage of having the most powerful engine (i.e. a Merc) and it would have allowed the two world champions to show off their skills. But even in the dry, the Jose Carlos Pace circuit usually throws up some surprises. When all the numbers were pushed through the strategy programmes, a three stopper came out as the fastest route to the flag in the dry. However, the very short lap distance means traffic is a problem and only the quickest cars would consider making so many tyre changes, with the Soft tyre only being used at the start, before completing the race on the Mediums. So a two stop is the more likely route, but if the rain came then all bets are off! Everything went smoothly for Alonso at the start, as he maintained eighth place, while Kimi emerged from the Senna Esses down in 12th place. The first pit stop came very early, as the Soft tyres degraded very quickly, after track temperature had exceeded 50 degrees. All the drivers tackled the second stint on the Medium tyres, which were clearly more consistent, to the extent that Fernando and Kimi extended the stint, making up places before their second stops. Kimi had a really strong race pace at this point, which, while the pit stops were on, saw him run as high as third. However, the Finn’s stop was slow because of a problem with the front jack, but Kimi didn’t give up, lapping quickly and consistently, so the team decided to run him to the flag without a third stop. Therefore, with Alonso having stopped three times, the two men found themselves running together and they put on one of the most thrilling duels of the day, fighting wheel to wheel but perfectly fairly. In the end, because his tyres were more worn, Kimi had to give best to Fernando, but finishing seventh, having completed one less stop than the rest. Nico Rosberg took the win for Mercedes, ahead of team-mate Lewis Hamilton, who keeps the lead in the championship, with Felipe Massa third for Williams. 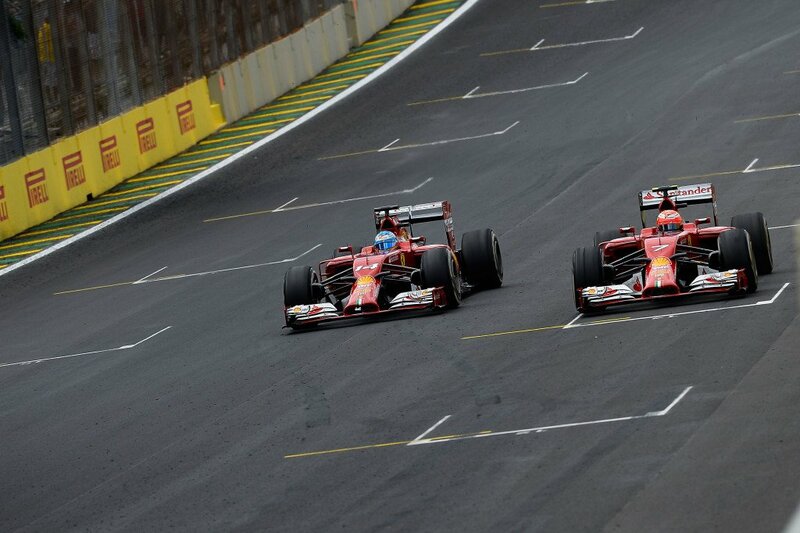 Fourth was Jenson Button (McLaren) and fifth was Sebastian Vettel (Red Bull.) The final round takes place in two weeks time in Abu Dhabi, with double points being allocated.